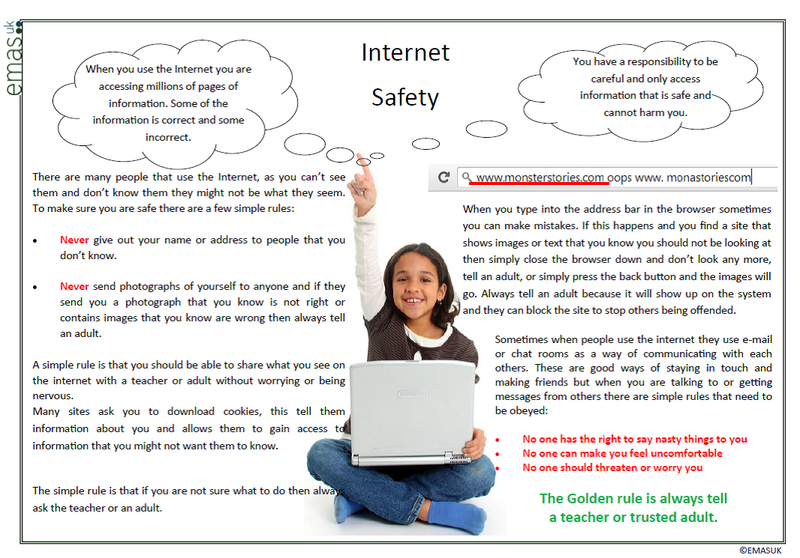 Today is Internet Safety Day to support you we have uploaded posters into the resource library, in the following languages Albanian, Chinese Cantonese, Chinese Mandarin, Czech, German, Latvian, Gujarati, Hungarian, Italian, Kurdish, Russian, Slovak, Polish, Romanian, Somali, Spanish, Turkish and Urdu. 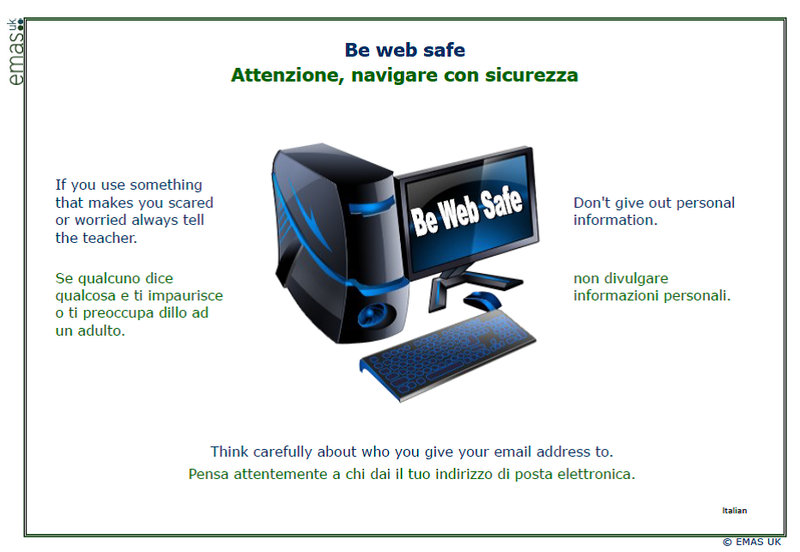 Here is the Italian poster which can be found in the Resource library under either the language are alternatively by subject, choose ICT or PSHE and then look for Web safety poster. Resource library available at £129.00 for 1 years membership contact us in the usual by by phone 0845 009 4939 or email us at info@emasuk.com. Following on from last weeks feedback from a nursery we have received emails asking us how our tools and resources can support nurseries, as up until now they believed that they were stuck. Here are a few of our suggestions. Find the resource EAL through storyboards in the library, under English, then choose a language or the languages in your setting. Use this to play finger rhymes Peter and Paul, Humpty Dumpty and Twinkle Twinkle. Support this further by using Terry (Talking Tutor) to say out the words in the child’s first language then repeat in English. Add to this further and develop language by asking one child to be Peter and ask them to hide, when the Rhyme suggests Peter returns and then answers questions about where he has been ( this is great for advanced learners). Sandbox – Use the sandbox to reinforce words e.g. use Terry (Talking tutor) to speak aloud words such as dig, cover and act it out, then repeat in English. Game – Where is the Dragon – Ble mae Ddraig? Choose a stuffed toy bear, duck, or in this case a dragon (well I am Welsh) etc. and tell the children they are going to play where is the Dragon. 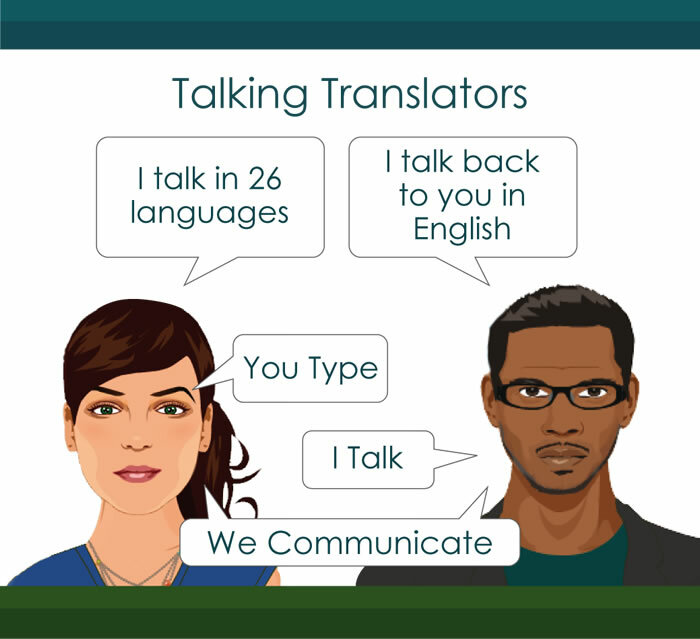 Use Terry (Talking Tutor) to say this in the home language. Place the dragon on, in, under items and then repeat. Less advanced learners will start of by saying on, there (and point to where it is) whereas more advance learners can expand and use their vocabulary by explaining, where it is, naming the item it is on, or under and construct the sentence well. Or snap see example below. 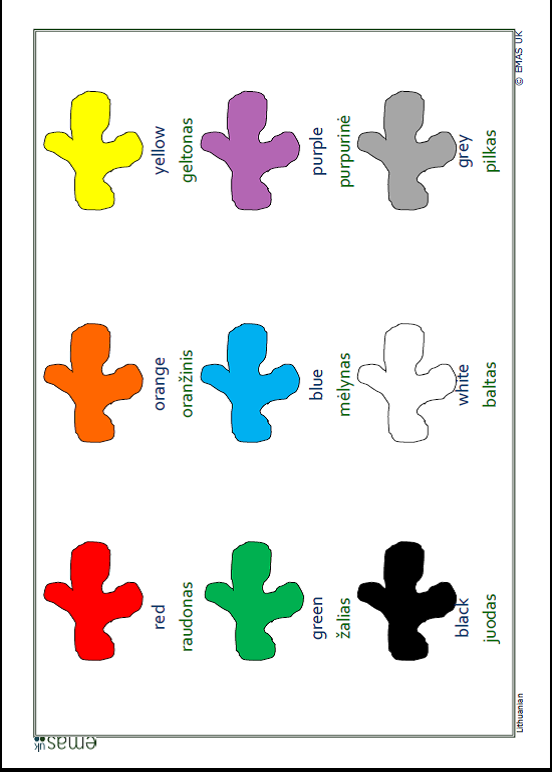 Use the Interactive whiteboard to learn shape or animal names. Ask the children to hide a bird and items on the board this could be a shape – e.g. behind the square, on top of the circle. 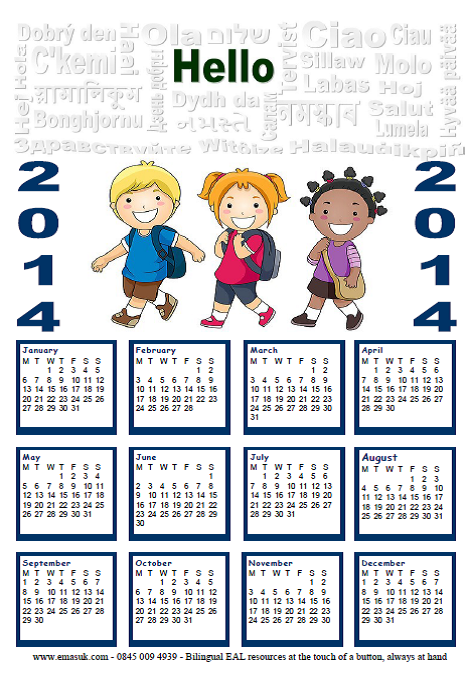 Add bilingual labels around the classroom. Sentences are better than words, remember to use small sentences to ensure they can use the word in context. Bilingual Poster showing colours in English and Lithuanian. 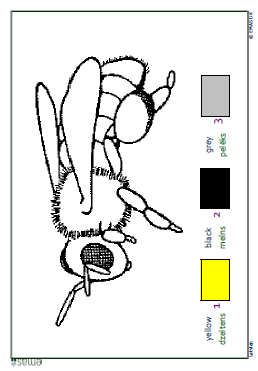 Use bilingual colouring sheets to support and embed language acquisition. Teach rhymes and then translate them and send them home to mum and dad remember that they don’t rhyme in other languages. Don’t forget songs are always good. Simple songs remind us of learning pattern, words, pitch, tunefulness and happiness. Use Talking Tutor, text tutor or Two Can Talk to translate songs and ask parents to help. 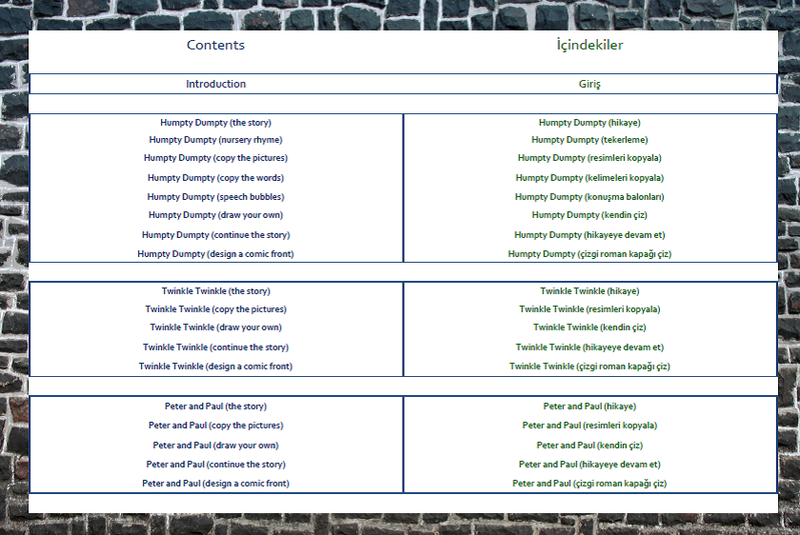 Finally look in the teachers section for the Early Year sheets for parents. School inspection handbook (120101), Ofsted, 2014; www.ofsted.gov.uk/resources/120101. The framework for school inspection (120100), Ofsted, 2014; www.ofsted.gov.uk/resources/120100. identify how much progress is made by individuals as well as groups of children and the cohort. 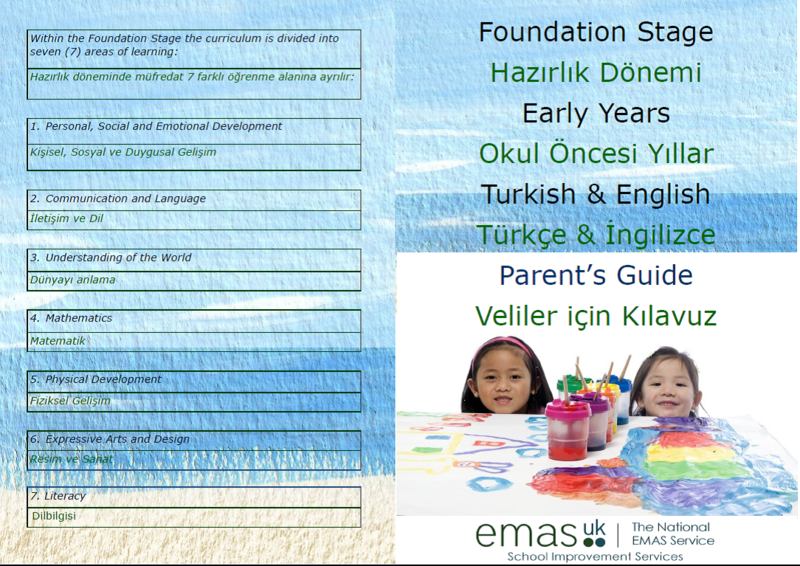 Children who speak English as an additional language: as indicated in the Early Years Foundation Stage Profile Handbook (2013) , learning to speak English as an additional language is not a special educational need. Practitioners should assess the development of children who speak English as an additional language in their home language as well as in English, where possible. While the children’s skills in communication, language and literacy must be assessed in relation to their competency in English, the remaining areas of learning may be assessed in any language. ‘Children must have opportunities to engage in activities and first hand experiences that do not depend solely on English for success, and where they can participate in ways that reveal what they know and can do in the security of their home language. For children to grow in confidence, and hence demonstrate their embedded learning, their environment must reflect their cultural and linguistic heritage and their learning be supported by a wide range of stimuli and experiences.’ (Early Years Foundation Stage Profile Handbook, page 15). During the initial contact with the school, the lead inspector must ensure that the headteacher understands that the inspection evaluates what behaviour is typically like, not just the behaviour of pupils during the inspection. Often, the grade for behaviour and safety is a grade higher than overall effectiveness. Where this is the case, reports will be given additional scrutiny. Please make sure that sufficient evidence is gathered to warrant the grade awarded. Inspectors should identify disruptive behaviour of any kind. This may be overt, for example, ‘shouting out’, or pupils ‘talking over the teacher’, or ‘arguing back’, or low level disruption, for example, through continuous chatter, not bringing the right equipment to lessons, not having books or doing homework, pupils arriving late to lessons, pupils chatting when they are supposed to be working together or pupils being slow to settle to their work and so on. It may also be more covert, taking the form, for example, of quiet reluctance from a number of pupils to participate in group work or to cooperate with each other. Inspectors should take into account any differences between the attendance of different groups of learners, such as those of different genders or ethnicities (for example Gypsy, Roma and Traveller children) when evaluating attendance. Inspectors should evaluate how much the school knows about the attendance patterns of groups of learners and the effectiveness of systems to alert them to changes in pupils’ attendance. A sudden or a gradual alteration can indicate a safeguarding issue. The increasing diversity and autonomy of schools and the decisions they make about the curriculum may present some contradictions. Inspectors will need to make a professional judgement about the appropriateness of the curriculum with respect to the specific circumstances of the school. In instances where there is major curriculum balance, or where the curriculum does not prepare children for life in modern British society, inspectors must say so clearly and explain why. Where governance is ineffective in a school judged as ‘requires improvement’ and is graded three for leadership and management, inspectors should include an external review of governance in their recommendations for improvement. The form of words to be used in the report under ‘What the school should do to improve further’ is ‘An external review of governance should be undertaken in order to assess how this aspect of leadership and governance may be improved’. It is for the school to decide how this review will take place, and to commission and pay for it. Such reviews aim to be developmental, and do not represent a further inspection. Full details on what might be the form and nature of such reviews can be found on the following link: http://www.education.gov.uk/nationalcollege/review-of-governance. It is expected that there will be many cases where inspectors will recommend both an external review of governance and an external review of the school’s use of the pupil premium. However, there may be instances where this will not be necessary, for example, where the proportions of pupils eligible for the pupil premium that make and exceed expected progress are above national figures and are similar to those for other pupils in the school, or where the number of eligible pupils is five or fewer. Even where leadership and management is judged to be good, inspectors should use their professional judgement to determine whether a recommendation for an external review of the school’s use of the pupil premium would benefit the school. The majority of the national curriculum is being ‘disapplied’ (ie suspended) from September 2013 for one year for most subjects to give all schools the freedom to change what they teach in order to prepare for the new national curriculum. Disapplication is a suspension of the content of the national curriculum, not the subjects themselves. New statutory programmes of study will be introduced for all subjects from 2014 (2015 for Key Stage 4 English, maths and science) – with the addition of foreign languages at Key Stage 2. ICT will be renamed computing. Whilst schools will still have to teach all national curriculum subjects, what they cover will be up to them. The intention is to help teachers to manage the transition from the old national curriculum to the new one. For example, teachers can stick broadly to the current national curriculum but will be able to vary when they teach topics and what topics they teach. They can use this freedom to cover any gaps in pupils’ knowledge and understanding to make sure they are prepared to learn the new curriculum from 2014. Disapplication is a permissive measure – no school will be required to change its curriculum in 2013/14. At Key Stage 4 for English, mathematics and science the freedom will last for two academic years because the new national curriculum will be taught from 2015/16 for those pupils. Teachers will still have to teach the national curriculum for English, maths and science to pupils in years 1, 2, 5 and 6 in 2013/14. This is to ensure that pupils are properly prepared for national curriculum tests at Key Stage 1 and Key Stage 2 in summer 2014. It is for schools to decide how the pupil premium is spent. However, they are accountable for their use of this funding. Since September 2012, schools have been required to publish online information about their pupil premium allocation and how they plan to spend it. They must also publish a statement of how they spent the money for the previous year, and its impact on the attainment of pupils eligible for support through the pupil premium. This is intended to ensure that parents and others are made fully aware of the impact on the attainment of pupils covered by the pupil premium. Local authorities decide how to allocate the pupil premium for pupils from low-income families in non-mainstream settings. The local authority must consult non-mainstream settings about how the premium for these pupils should be used. any differences made to the learning and progress of pupils eligible for the pupil premium as shown by performance data and inspection evidence. In many schools, the number of looked-after children is small and these pupils may not figure in headline performance data. Inspectors should record evidence of the impact of the pupil premium on looked-after children currently on roll in the school on a separate evidence form. Inspectors should note that they should not report separately on the progress, attainment and/or achievement of pupils eligible for support through the pupil premium, or make comparisons with the progress made by other pupils, where individual pupils eligible for support through the pupil premium might be identified. Generally, this will be the case where there are five or fewer pupils at the school. However, where a small number of eligible pupils represents a sizeable proportion of the overall number of pupils on roll, inspectors should exercise their judgement on reporting on how well these pupils are supported. Inspectors should be mindful that the need to avoid identification of individuals remains a key consideration. Inspectors must evaluate the performance in English and in mathematics of groups of pupils who are supported through the pupil premium. Where a gap is identified between the performance of pupils supported through the pupil premium and all others in the school, inspectors must report this and whether it is narrowing. They should express gaps in terms of National Curriculum levels or a period of time (such as ‘two terms’) at the end of Key Stage 2, or GCSE grades at the end of Key Stage 4. The following table shows suitable ways of expressing gaps in average points scores using plain language and simple fractions, which should be reported in words. Inspectors should take into account the way in which the school divides up the school year, such as into terms, in selecting wording that readers will understand. Inspectors must also evaluate and report on the progress being made by pupils targeted for the Year 7 catch-up programme, including through analysis of summary data kept by the school. Studio schools and UTCs, for example, are established with a particular curriculum, based on a different rationale and approach to teaching. The pupil premium is specific, additional funding provided to support the education of pupils known to be eligible for free school meals, pupils who have been eligible for free school meals at any point in the last 6 years (known as the Ever6 free school meal measure), children who have been looked after continuously for a period of 6 months and children whose parents are currently serving in the armed forces. See http://www.education.gov.uk/schools/pupilsupport/premium/a0076063/pp for further information. It was brilliant to get this through in the postbag this week from a nursery teacher in Lincs. 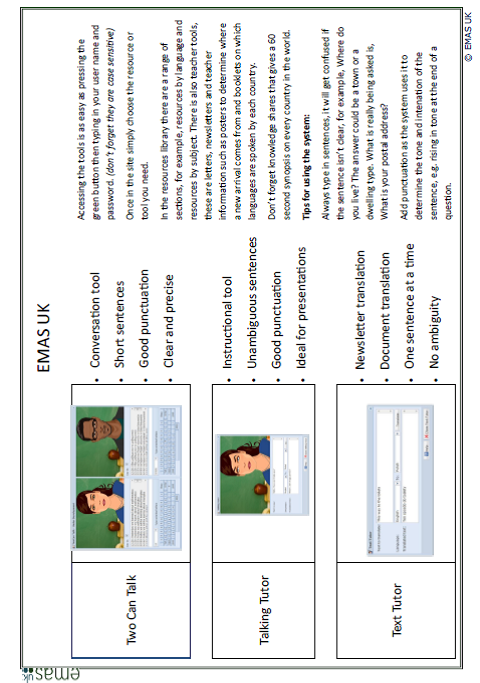 I am writing to commend the EMAS resources programme. I run a school based nursery with 76 3-4 year olds in attendance. 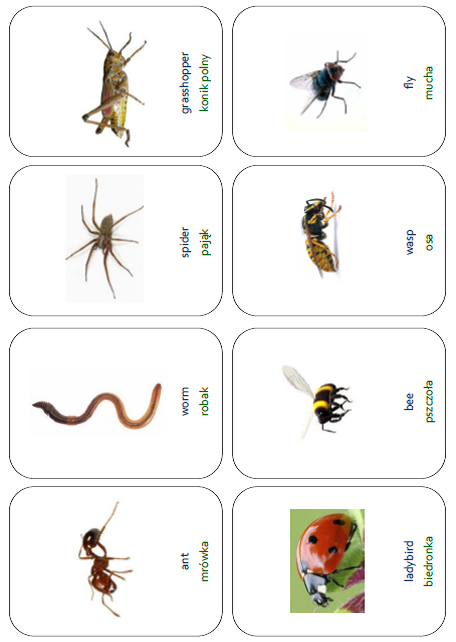 I use the talking tutor tool on a daily basis to help communicate with my polish EAL children with remarkable success. Brilliant news reassuring us that its child’s play to use and ensures communication with pupils no matter what their age. Equally it can be used by doctors and health professionals to talk in paediatric settings. 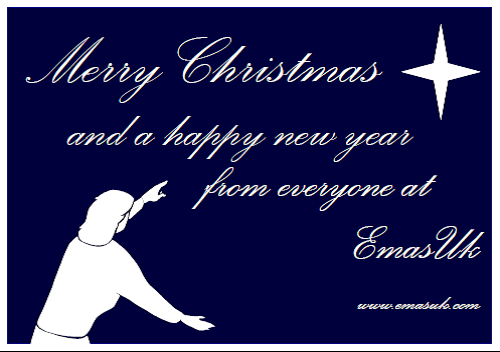 Wishing you all a Merry Christmas and Thank you. Put up on your wall for forward planning. Looking forward to blogging again in 2014.